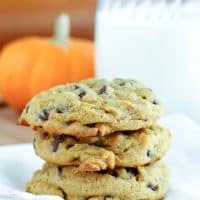 I have been looking everywhere for a recipe for Chewy Pumpkin Chocolate Chip Cookies that actually tastes like a cookie, not a little cake, or a muffin top. I never found one, so I took matters into my own hands. The secret, which I learned after some investigating and experimenting, is to omit the eggs. I know it sounds crazy, but the pumpkin acts as an egg replacement. Made these for my daughter’s 1st birthday party over the weekend and they were a BIG hit! Even the little kids gobbled them up instead of the sugar-rush cupcakes. The resulting cookie is dense and chewy, more like a traditional chocolate chip cookies, but with the flavors of pumpkin and spice and everything fall! The dough will be a little sticky, and the cookies will be quite soft right out of the oven (be sure not to over bake them though, or they will be dry) but they’re just perfect once they’ve cooled. 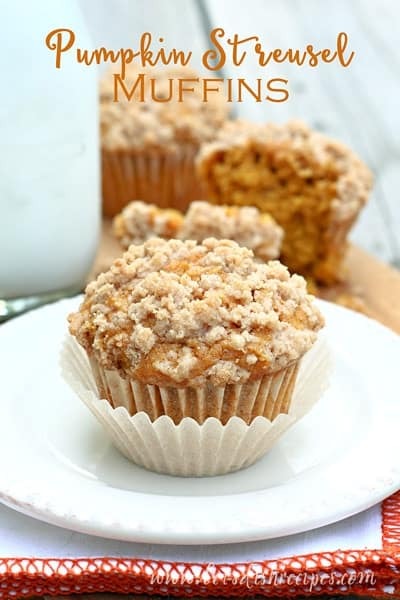 I do use the extra 1/4 cup of flour, as I am at a slightly higher altitude, and I find it helps, but you may not need it if you are closer to sea level. These chewy pumpkin cookies are like a dream come true for me. 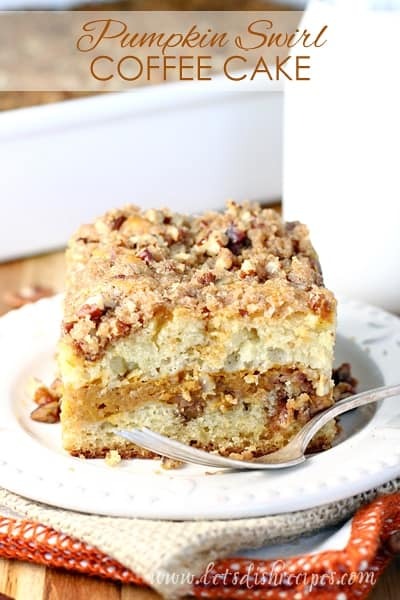 I can’t wait to experiment with this recipe even more. In fact, I think I’ll try a chewy pumpkin oatmeal cookie next! 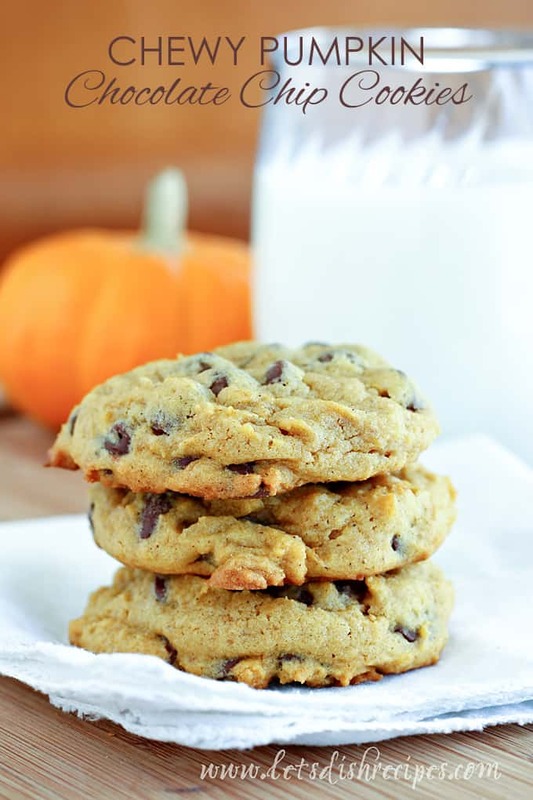 Be sure to save this recipe for Chewy Pumpkin Chocolate Chip Cookies to your favorite Pinterest board for later. These delicious pumpkin cookies are loaded with chocolate chips, and they're soft and chewy--not cakey--just like a cookie should be! Cream together butter and sugars for 5 minutes with an electric mixer on high speed. Add vanilla and pumpkin and beat 3 minutes more. In a medium bowl stir together salt, baking soda, baking powder, cinnamon, nutmeg, cloves, allspice and 2 3/4 cups of flour. Mix dry ingredients into pumpkin mixture. If dough seems very sticky, add up to an additional 1/4 cup of flour. 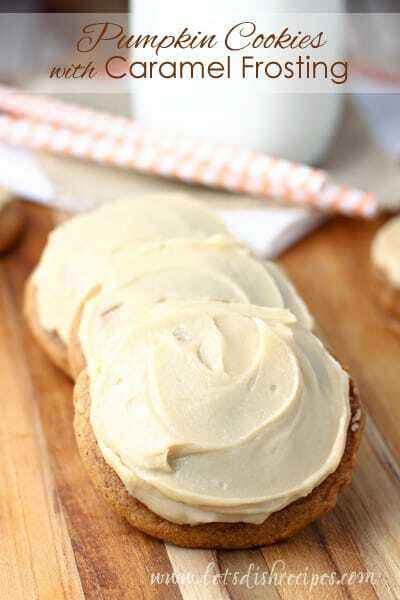 Drop by large, rounded tablespoons onto ungreased cookies sheets. Flatten the cookies slightly with the palm of your hand before baking (use a slightly damp hand if the dough is sticking). Bake for 8-10 minutes or until cookies are just beginning to brown. Who Dished It Up First: This is an original recipe, loosely based on my favorite chocolate chip cookie recipe. Thanks for doing the work for me! This recipe looks delicious. Thanks. Thank you so much for this amazing recipe !!! I baked them twice and both times turned out great! They’re just so yummy that I can’t stop eating ! Smart lady! I, too, am tired of those cake-y pumpkin cookies. Sorry, I just had to post another comment on this recipe. Made these for my daughter’s 1st birthday party over the weekend and they were a BIG hit! Even the little kids gobbled them up instead of the sugar-rush cupcakes. I multiplied the recipe and made a ton so I graciously sent baggies of cookies home with anyone willing. Many called me later to tell me their cookies never made it home. =) Thanks again, Danielle, for the best cookie recipe ever!